Some or all of the hosts of The Fab Furniture Flippin’ Contest receive monetary and/or product compensasion from the sponsoring brand, HomeRight®, in order to complete themed projects. HomeRight® will also provide the prize package for the contest winner. It’s time for another Fab Furniture Flippin Contest Project. This time it’s a project for me, well sort of, it’s for the family room so it’s for everyone, right? I’ve really been crushing on navy lately so I decided our family room needed a Navy Painted Side Table. Do you remember my first two projects for this contest? I made a Clock table for my mother-in-law and a headboard for my daughter. I truly have the best kinds of friends! A friend was trying to get rid of this side table, of course I took it happily!!! There’s nothing wrong with it but I wanted to paint it. Prep work included taking the drawer out and just wiping it all down and removing the knobs. I found the perfect navy color at Lowe’s called Fairmont Penthouse Mosaic Blue 4009-6 and had a quart of Valspar furniture paint made up in that color. Note: wet it looks way lighter but relax as it dries its Navy! This month the contest is sponsored by HomeRight®. They were so nice they supplied each contestant with a Finish Max Fine Finish HVLP Sprayer. I was so excited when that box arrived on my doorstep! I had been wanting a sprayer! Thank you HomeRight®!!! I must state this: Read the sprayer instructions first then buy paint or stain. I didn’t read the sprayer instructions before I bought the paint. The paint clearly says “do not thin” however the sprayer instructions have a nice chart and flow cup thing to test your paint to determine if you need to thin your paint. The furniture paint is thick and probably needed thinned but I was afraid of ruining the rather expensive can of paint. So I used it as is, in the sprayer, I think because it was so thick the spray tip got clogged a little but I dealt with it and am happy with the results. What did I tell you about this Navy! Oh the color makes me so happy. What do you think of Navy, are you crushing on it too? This month the contest theme is “Spray It Pretty.” This table started out as a basic side table that had I just added it to our family as is would look just fine. As a DIY’er and blogger I am constantly updating our decor and trying new ideas. 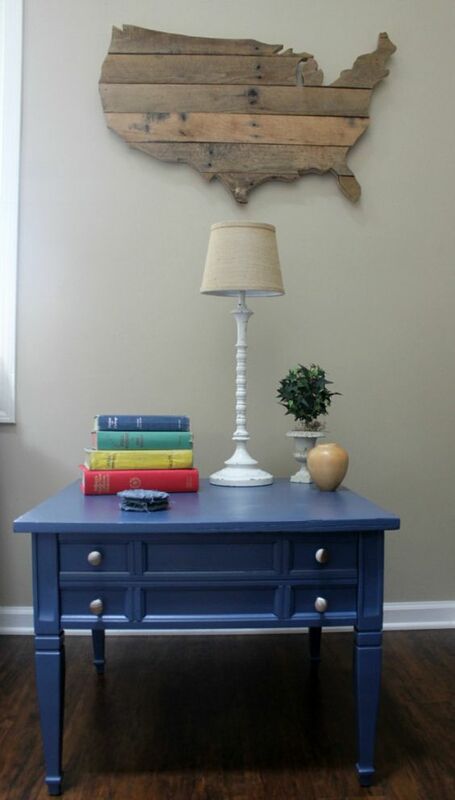 Since I LOVE blue and this Navy table is just what our family room needed I think it is Pretty! 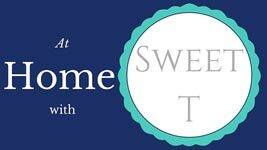 As I mentioned this is a contest for bloggers, each month has a different theme and each month has a different sponsor and participants. If you would like more info about joining The Fab Furniture Flippin Contest contact info@fabfurnitureflippincontest.com To see all of the great project you can visit Evey’s blog here or Lynn’s blog here, and be blown away by all the creativeness each month.